Banksy, internationally renowned graphic designer and street artist, has once against left one of his anonymous graffiti pieces for the world to enjoy, this time at Bright Farm primary school in Bristol, England. 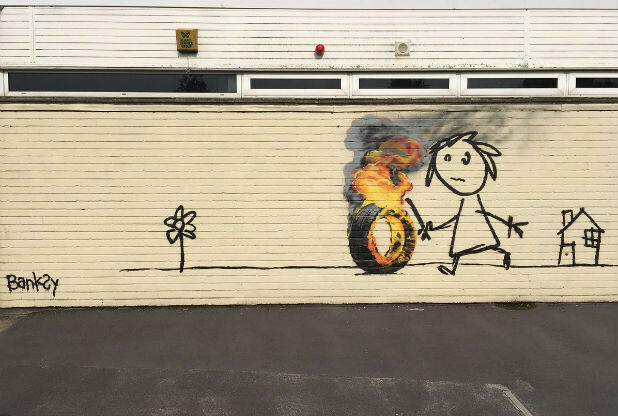 The piece, which depicts a crayon-like drawing of a schoolgirl playing with a realistic flaming tire, was drawn in thanks to the elementary school for their recent naming of one of their four school houses after Banksy. On top of that, Banksy, who is said to have been born and raised in Bristol, left a personalized note with the art piece, thanking the school for naming the building after him and encouraging students to add onto the artwork, cheekily stating “it’s always easier to get forgiveness than permission”. The school has decided to keep the artwork as is, in order for the piece to serve as inspiration for their student body.